Fleas are the common enemy. Medications to kill fleas are toxic, and directions must be followed with care to avoid accidental pet poisoning. More isn't better. Accidentally putting dog flea control (or the wrong dose) on a cat happens, though, and it is a frequent emergency question. We asked veterinarian and veterinary toxicologist, Dr. Ahna Brutlag from the Pet Poison Helpline (PPH) for her insights on this problem of flea control toxicity in cats. Topical spot-on insecticides are the number one feline toxin reported to Pet Poison Helpline. Poisoning most often occurs when pet owners accidentally (or, sometimes, intentionally) apply dog-specific topical flea/tick products to their cats. Those products that contain insecticides from the pyrethrin or pyrethroid family are the culprit (e.g, permethrin, cyphenothrin, etc.). While these insecticides are safe for dogs (and people), they are extremely toxic to cats because our feline friends lack the metabolic pathway to quickly detoxify these chemicals. Dogs and people, on the other hand, are rarely poisoned by these chemicals. 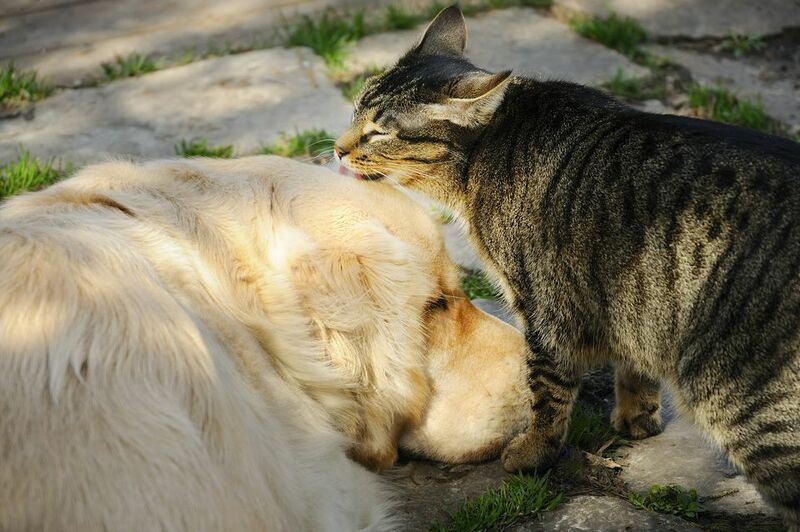 Cats can also be exposed by grooming (licking) a dog that recently had the product applied or, rarely, even licking the bedding of a dog following application. Remember, cats are not just small dogs. It’s best to think of them as an alien life form that does not obey the rules of other mammals. Generally speaking, if you notice your mistake within a few minutes of application, the best option is to immediately (and thoroughly) bathe your cat with liquid hand-dishwashing soap (e.g., Dawn). We recommend two to three latherings just to be safe. If like you liken the idea of bathing your cat to wrestling an alligator, you’re better off bringing him straight to your vet for a thorough cleaning. There’s nothing worse than a half washed cat and an arm full of bite marks to ruin your day. If you don’t notice your mistake until your kitty starts showing twitches or tremors, DO NOT BATHE! Bring your cat immediately to your vet instead. If you were to put a twitching/tremoring cat into the water, chances are that she will become so overstimulated that she’ll start to have seizures. Instead, your vet will sedate your cat, stop the tremors and then safely decontaminate her. If you caught your mistake in time to safely bathe your cat, your next step is to monitor her very closely for at least 8-12 hours. By "monitoring very closely," we mean checking on her at least every 15 minutes. Set a timer and be diligent about this. Do go to a movie and leave her at home, do not go grocery shopping, do not go on an hour-long run, and most important of all, do not go to bed! We’ve had several occasions where pet owners thought they had thoroughly bathed their cat and, believing all was well, went to sleep for the night. They then awoke to find their kitty with severe tremors or seizures the next morning. These are terrifying situations and completely preventable. If you aren’t able to stay with your cat, bring her to your vet—they will be able to monitor her while you’re away and, should signs of poisoning arise, they can immediately begin treatment. Concentrated pyrethroid or pyrethrin-based insecticides cause neurological stimulation in cats as evidenced by muscle twitches, tremors, and seizures. Often, these signs start within a few hours of application and can last for days and be fatal if left untreated. If a cat starts to show muscle twitching, it’s time to get to the hospital. Mild twitching can quickly progress to serious tremors and seizures, both of which can be effectively treated by your veterinarian with injectable muscle relaxants. Additionally, twitchy cats may have difficulty eating and drinking which can result in dehydration and, in severe situations, fatty liver disease (this can occur in cats, especially obese cats, that do not eat for more than two to three days). While these signs can be very serious or fatal, it’s important to know that these kitties have an excellent prognosis if treated quickly and appropriately. The drugs given to cats to combat this drug are safe and highly effective. Aspirin Is not Safe for Cats and Neither Is Tylenol or Advil.